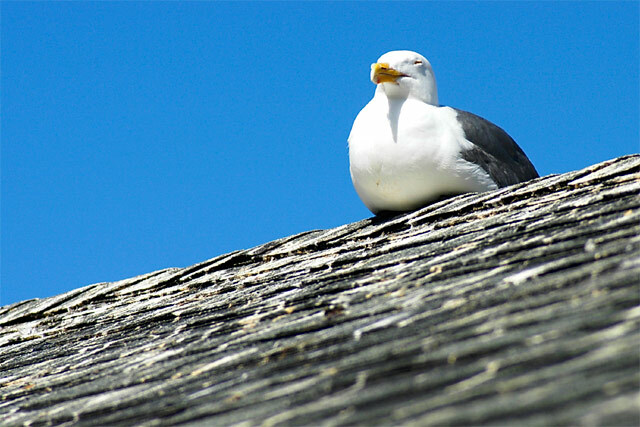 Chillin' Gull: Sitting atop Sam's Fishing Fleet building in the late afternoon, Fisherman's Wharf, Monterey CA. Nikon D100, Tamron 70-300 1:4-5.6 D LD, 210mm f8 1/1000sec. ISO320, Programmed mode metering unfortunately blows out some highlights in this photo. Better examples with manually set speed and f-stops came out much better (to be posted soon).